The grr-ific musical for little tigers and grown-ups alike is back! The hugely popular Daniel Tiger’s Neighborhood LIVE!, based on the #1 PBS KIDS TV series, has delighted live audiences on stages across the country. 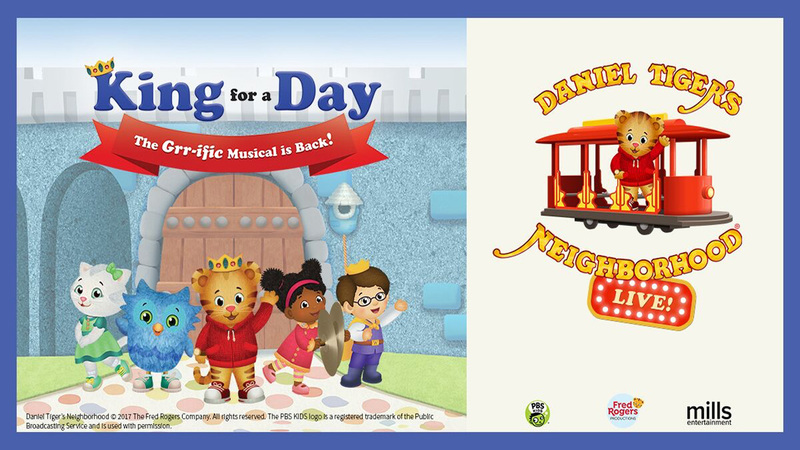 Now, in its fourth year of touring, your favorite characters are hopping back on board Trolley and coming to your town with DANIEL TIGER’S NEIGHBORHOOD LIVE: KING FOR A DAY!, Daniel and all of his friends invite you for a brand-new adventure in Neighborhood of Make-Believe where Daniel learns just what it takes to be King. The beloved characters come alive on stage to captivate you with new songs to sing along to, magical moments, and SURPRISE guests along the way! It’s an event filled with tigertastic fun, teaching the valuable lessons of kindness, helping others, and being a friend. Don’t miss Daniel Tiger’s Neighborhood LIVE: King for a Day… a royally great time!